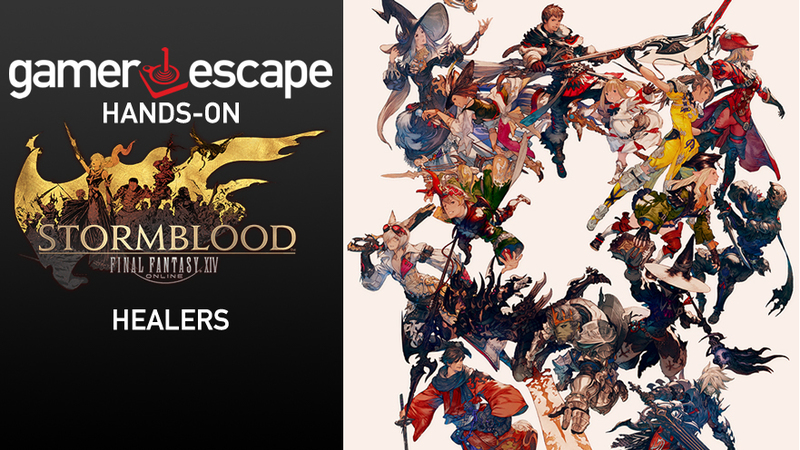 A couple weeks ago we had the opportunity to get our hands-on with Final Fantasy XIV: Stormblood! 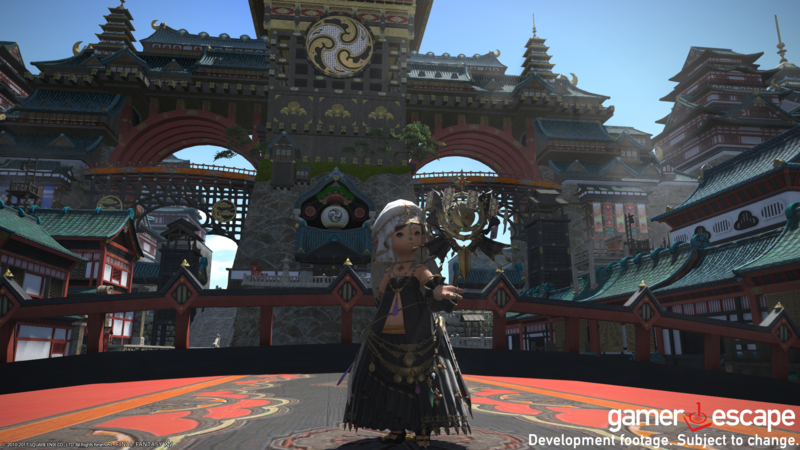 In this article, we’ll examine the changes and additions coming to Healers! Please note, all tooltips shown are from a development build and are subject to change before final release. Healers win this one. There were so many annoyances and missing abilities in the current cross class lineup for healers. I mean, how many times have we heard of healers without Swiftcast alone? Those days are over! Right out of the gate, we seem huge improvements. At level 8 healers receive the reworked Cleric Stance. Now the ability itself is pretty uninspiring, a 90 second cooldown that buffs attack magic potency by 5% for 15 seconds. But the removal of the main stat switch and the weird delay that accompanied it are great. At level 16 all healers receive Protect, great, no introduction needed there. Another shared role ability pilfered from White Mage is Esuna now gained by all healers at level 20. This is another great change, especially for those poor Scholars out there that otherwise had to wait until the mid-thirties for their equivalent. The next ability Lucid Dreaming is a 120 second cooldown that reduces enmity by half and adds an 80-potency refresh effect for 21 seconds. Shroud of Saints, is that you? Yet another ability that White Mage had is now shared between all healers. 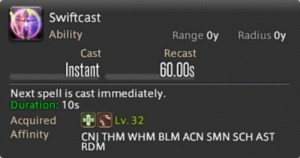 Thankfully at level 32 all healers get their hands on Swiftcast, which was an invaluable tool that could be completely missed. 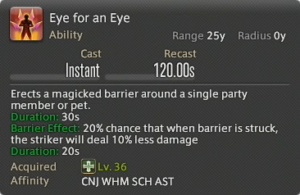 Next, Eye for an Eye is now given to all healers at level 36 complete with the 120 second countdown that was previously the effect of an extra trait. Eagle eyed viewers of the Live Letter noticed that White Mage didn’t have the icon for Divine Seal and they were right. Largesse is a 90 second cooldown, gained at level 40, that has very similar effects. It increases healing magic potency by 20% for 20 seconds. This will be very interesting for Scholar and Astrologian and their healing potency based shields. 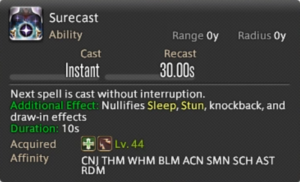 At level 44 healers have the option to use a powered up new version of Surecast. It retains the ability to cast one spell without interruption, however now it also nullifies sleep, stun, knockback and draw-in effects for up to 10 seconds. Wow, welcome to ignoring all of that annoying crap every 30 seconds. Lastly at level 48 healers gain access to Rescue a 150 second cooldown ability that annoys anyone you cast it on. Scratch that, apparently the tooltip says that it instantly draws a target party member to the caster. Now, of course, there are some great uses of this ability, but if it is off cooldown and it seems like it won’t wipe the group, I am sure some poor DPS is going to suddenly be very annoyed. The only problem with these abilities is that most of them are incredibly useful. Lucid Dreaming, Swiftcast, Protect, Largesse are basically required. Though there is a possibility that healers will now coordinate which one will bring Protect and Esuna. Surecast is suddenly useful, and Cleric Stance is a bit underwhelming, but it is a DPS increase. Really only Break and Rescue are questionable and highly situational. White Mage has recently found its spot in the meta usurped by the buff-slinging Astrologian. As a “Pure Healer” White Mage is invaluable during the progression phase of raiding, but as players learn to make less mistakes, and push higher damage, Astrologian and its buffs start to give more of a benefit, while not losing much in the way of healing throughput. Stormblood – Doesn’t fix this at all… But hey, you get a barrier type spell, an interesting stack mechanic, an awesome cooldown, bigger rocks, and some pretty flowers! Enough with the flowers, what the heck do they do!? There is a 20% chance upon casting Cure or Cure II that you will gain a lily. 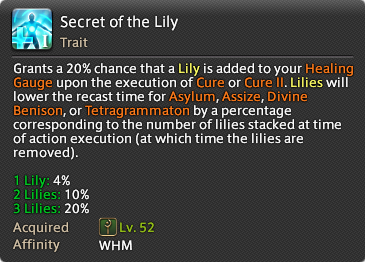 Each lily gives you a stacking recast time reduction to the next spell you cast of those in this list: Asylum, Assize, Divine Benison, or Tetragrammaton. The recast reduction is 4% for one lily, 10% for two and 20% for three. So, for example, building up three lilies and using Tetragrammaton would reduce the cooldown (recast timer) of it by 20%, from 60 seconds to 48. This would basically add one extra Tetragrammaton per 5 minutes. Another trait related to this system is added at level 68, which grants a 20% chance that Asylum or Assize’s recast time is reduced by a flat 5 seconds each time a Cure or Cure II deals critical healing. 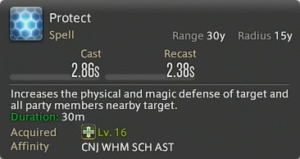 It seems that the intention is for White Mage to have these tools available more often over the fight and allow them to heal while dealing with mechanics or doing damage. A new ability among those listed is called Divine Benison. This is a 60 second cooldown that creates a barrier around a target that absorbs 15% of their current max HP in damage. 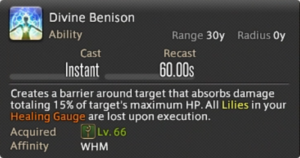 Divine Benison uses all of your current lilies; however, it doesn’t scale per lily consumed, it just receives the aforementioned recast time reduction. Unrelated to the lily system is a new ability with an all new mechanic called Plenary Indulgence, and this is an interesting one. As you heal party members with Cure and Cure II (sensing a pattern here?) there is a 20% chance that they will gain stacks of Confession. These stacks last for 30 seconds and power Plenary Indulgence. Once used, this ability will cast an AoE heal centered on that target up to 30 yalms, which is the same size as Cure III, on a 15 second cooldown. The potency of the heal depends on that player’s Confession stacks, 1 Confession is a 400-potency heal, 2 is a 500-potency heal and 3 is a whopping 600-potency heal, which is 50 higher than Cure III. This is a very interesting “Stored-heal” kind of mechanic that could see some great emergency heal usage all while the White Mage uses no additional MP. 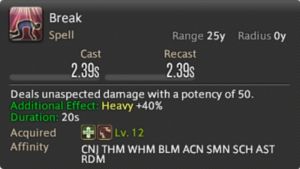 On the damage side, the only new spell that White Mage receives in Stormblood is Stone IV. Though, it will feel like you are throwing boulders at your enemies with its 260 potency, the same as Fire IV. White Mage does lose Shroud of Saints to the role based action list, however at level 62 they will receive one of the most versatile cooldowns yet. Thin Air is a 120-second cooldown ability that reduces the MP costs of all spells cast to zero for 12 seconds. Yup, every cast, absolutely free. The usage of this are quite amazing. From Holy spam, to emergency healing, to a flurry of raises, or just fishing for lilies. Popping Presence of Mind and Thin Air is going to turn the White Mage into a conduit of Holy power. White Mage was probably the least explained Job in the Live Letters, but one with the most additional features. 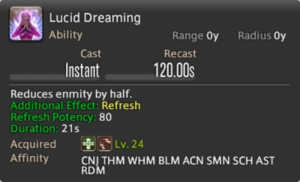 Lilies, new Confession stacks and infinite (for 12 seconds…) MP, but I can’t help but feel disappointed that White Mage received no DPS synergy. With Scholar gaining a 20% crit buff, and Astrologian being Astrologian, is there room for the Pure Healer? I hope so. SCH – Set it and forget it! Scholar has long been thought of as a preventative or preemptive healer. They are the premiere “Off-Healer” in the current meta. Their job is dampening incoming damage, helping out in emergencies and putting out as much DPS as they can otherwise. 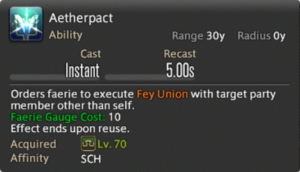 Thankfully, Stormblood adds more tools to reinforce that role and add some party DPS synergy. 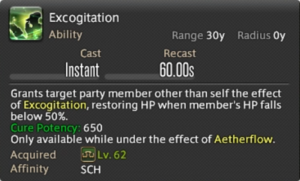 Excogitation is a new Aetherflow spender with a 60 second cooldown, but, is a preemptive heal that once placed on a party member triggers a 650 potency heal once they fall below 50% health. This is an amazing tool in the right hands and better yet, the tooltip does not specify if the effect has a duration. If that is true, Scholars can essentially turn a lustrate that they’d have to pay attention to, into a instantly triggered heal bomb while they deal with something else. Scholar also receives a new pet ability called Aetherpact, which triggers your fairy to use “Fey Union” that new fairy to party member tether skill seen in the live letter. It seems as though as you spend Aetherflow stacks you gain power on your new Job UI’s Faerie Gauge. Casting Aetherpact costs 10 power to initiate and Fey Union drains 10 power per tick as it heals the party member that you have designated. While Fey Union is active, your pet will do nothing but heal that target. 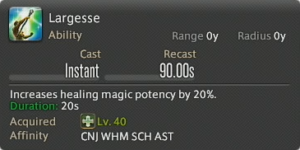 The potency of this heal is not currently known, but considering the cost of increasing the gauge it must at least be 300 which is a very powerful regen. Scholars will also gain two new damage abilities, Broil II and Chain Strategem. Broil II is boosted Broil with a potency of 230, but the same MP cost, which is great. Chain Stratagem is the “libra” like animation that was shown during the Job Action trailer. It is a 90 second cooldown that increases the rate at which a target is critically hit by a generous 20% for 15 seconds. Did you just hear that? as if millions of White Mages suddenly cried out in terror. While not as incredible as an Astrologian’s Balance card, this debuff will certainly help to reserve Scholar a spot in the meta, and DPS player’s hearts. AST – Oh my God, it’s full of stars. Astrologian has had a bumpy history throughout Heavensward. It took a long while, and quite a few buffs to get them here, but now they are ubiquitous thanks to their unique buffs. 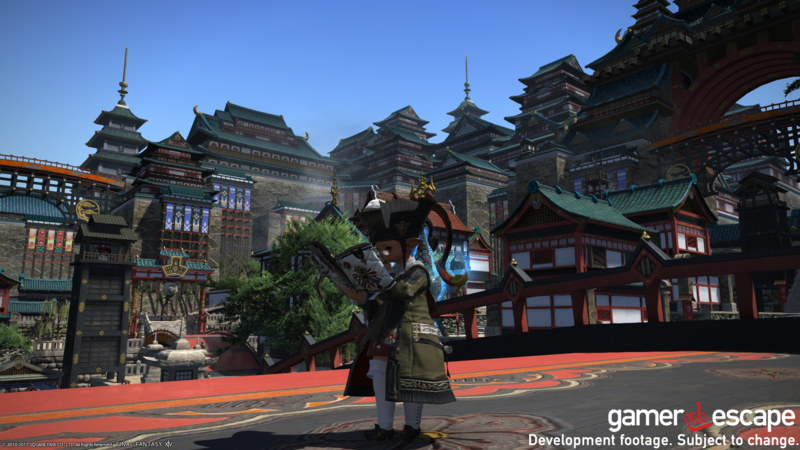 Stormblood brings a Job UI to help them sort out all of their card effects, a couple of new healing and DPS options, a new type of card, and a cool down that would get them kicked out of every casino in Vegas. 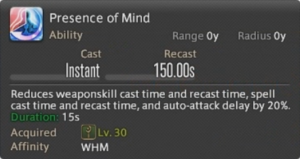 The second flashiest new ability in Stormblood belongs to AST. Earthly Star is an AoE spell that you set down and press again to use its effect. When you trigger this trap card it deals 150 potency of damage to any enemies in range while healing allies for 675, which is just a tad higher than Benefic II. However, if you leave the AoE alone for 10 seconds it will gain the Giant Dominance effect. 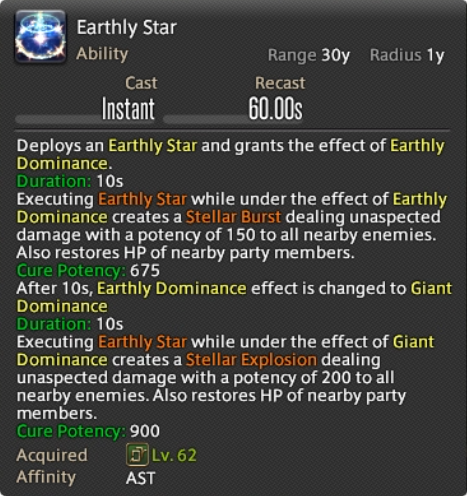 When you use Earthly Star under that effect the damage jumps to 200 and the heal tops out at a whopping 900 potency which is heads and shoulders above any heal currently in the game. This adds a preemptive heal for all of those “Reduce the party to 1 health” type of moments. This isn’t quite a “Oh S#!^&” button, but will reward those who know exactly when the party needs it. Astrologian also receives two new cards and a new ability to draw them in Minor Arcana. Minor Arcana can transform your drawn card randomly into either the Lord or Lady of Crowns. The Lord of Crowns was shown in the benchmark trailer and is a card that is used to attack a single target with a potency of 300. The Lady of Crowns is a 500 potency heal to an ally. The best part of either card is that once you use minor arcana, that card sticks with you and will not be overwritten by your normal draw process. In this way, you can keep an ace up your sleeve. 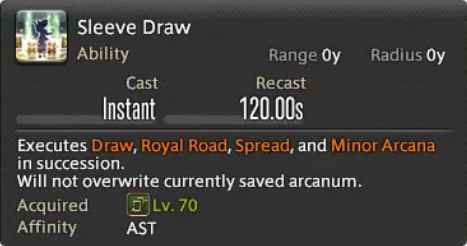 The last ability that AST gets is a mulligan in the way of Sleeve Draw. Sleeve draw executes a Draw, Royal Road, Spread and Minor Arcana, and fills your Job UI with each card, 0-100 real quick. Of course, you can then decide to redraw/royal road/minor arcana from there, but it essentially lets you stack the deck every two minutes. I look forward to hearing my static’s Astrologian curse about how many Boles this ability gifts them. Your comparing Plenary Indulgence to Cure 3 is incorrect. Unless Cure 3 has been changed, it has a range of 30y and a radius of 4y, Whereas Plenary indulgence has a range of 0y (means it targets self) and a radius of 30y. the next biggest heal Radius is Medica 2 with a range of 0y but a radius of 25y. most AOE heals are 15y. If you watch the video he uses Planetary Indulgence on the DRG, which means perhaps the tooltip is incorrect. Having the DRG targeted doesn’t mean he uses it on the DRG. The cast effect appears over him as well (you can cast on yourself if you have other people targeted). The DRG also gets healed because he has a stack on him. The issue is he didn’t need to target the DRG. Look at the animation. It comes from the WHM and hits any person with confession within 30y. There is no AoE heal on target. I find the writeup really confusing on that, yeah. 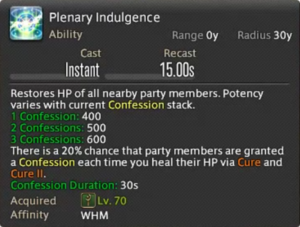 Plenary Indulgence only heals people with confessions, which only go up on single target heals, only last 30 seconds, and only have a 20% chance per cast? That’s less of an AoE heal and more “this will probably heal the tank and maybe someone else on a good day”. You’re almost never going to have stacks on 3 DPS at the same time, let alone enough stacks for the big effect. If you can cast it on someone and it heals everyone around them based on the targets confessions only (which is what the text suggests), that is a much better spell. Hopefully some testing will clarify that. PI just seems like a hot mess. I don’t think there is an obvious UI element for the stacks, unless it is a buff icon. But that seems like it flies in the face of the UI streamlining they have been working toward. WHM’s rebalance is by far the most contrived and is trying to find a reason to exist rather than streamline or reinforce the job’s design. Cure 3’s radius is actually 6y and Medica 2’s is 20y according to the in-game tooltips. Largesse may be the new Divine Seal, but it’s potency has been reduced by 10%. Divine Seal is 30% healing potency increase where as Largesse is 20%. 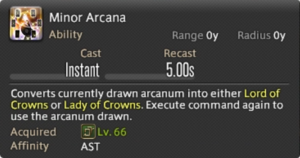 My question is (and no one putting out content yet has touched on this); With the moving of both AST and WHM Healing Potency+ cooldowns to Largesse has Dissipation changed? It would be a fairly punitive cooldown if they removed the Healing Potency+ portion of it and made it a swap of pet for Aetherflow. Does this mean Synastry is gone?!?!? Thank you so much for this breakdown! The new mechanics seem interesting…I can’t wait to mess with them. I have one grammatical correction, though, hopefully not too pedantic: possessive its does not have an apostrophe anywhere. Although SCH did not have esuna access till the thirties, Selene does at level 20. So that technically isn’t true.